The Essex County Bulldogs U12 rugby team practicing a scrum before a recent match. A lex Murphy is 9 and easily the smallest player on the rugby pitch in West Newbury. His dad calls him “Bear” because he’s “quite tenacious.” Though Alex doesn’t get much playing time yet on his under-12 team, he’s fearless at practice. “That’s because he hasn’t got properly hurt yet,” says Colin Murphy, an executive recruiter from London who lives with his family in southern Maine. In the age of anxiety over young athletes’ concussions and the rising rate of ligament-reconstruction surgery for young baseball and soccer players, bruises and ankle sprains are part of the program in rugby. It’s surprising, then, to learn that it’s the fastest-growing youth game in the nation, according to the Sports & Fitness Industry Association. While participation in football and baseball has been declining steadily for years, rugby enrollment grew 81 percent from 2008 to 2013, beating out lacrosse and hockey. Rugby’s popularity can be attributed in part to increased media attention around the game, observers say. Coaches and longtime rugby fans also point to the fact that the game makes use of various skills young athletes acquire in other popular team sports, making the learning curve less steep. Watching the Essex County Bulldogs practice on the green fields of Pipestave Hill, Colin Murphy smiled. He’s well aware that most parents would recoil at his suggestion that his son hasn’t been “properly hurt” yet. In fact, sport and medical professionals suggest that the lack of pads in rugby tends to result in fewer serious injuries compared with football as players are trained to take greater care with technique, and many studies have agreed. Players are taught watch out for heads and necks and tackle using their arms and shoulders “to wrap” up an opponent. Coaches acknowledge plenty of bloody noses and black-and-blue marks, but major injuries are reportedly less common than in most other contact sports (and some that don’t allow contact). Seattle Seahawks coach Pete Carroll recently released an instructional video in which he credited rugby players with a style of tackling he now teaches his National Football League team. “Rugby players have truly taken the head out of the game and truly exemplify shoulder tackling,” he said at the time. 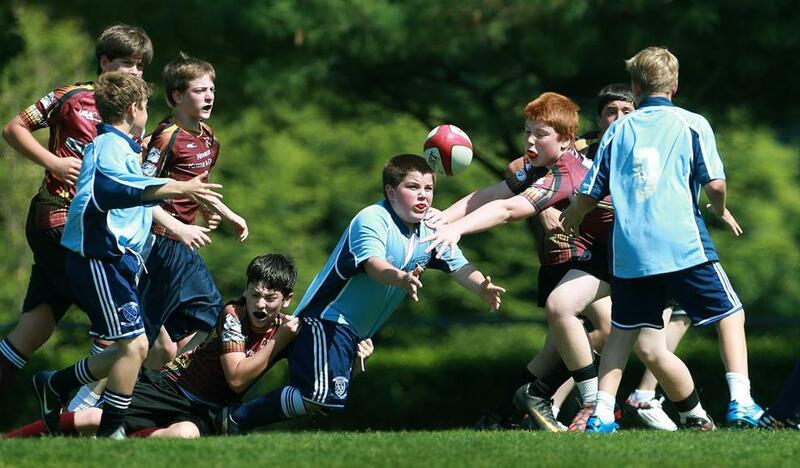 As a result, the injury rate in rugby “is probably more comparable to soccer than football,” said Dr. Lyle Micheli, director of the division of sports medicine at Boston Children’s Hospital and founder of the Micheli Center for Sports Injury Prevention. As a student at Harvard, Micheli played both rugby and football. Players and parents also appreciate the culture of hospitality that surrounds the game. Just as adult rugby players famously drink a beer or three together after a game, youth clubs share pizza and soda after they play. The Essex County Bulldogs U12 team (in maroon) playing a team from Derby Academy (in blue) in a recent game played in Hingham. “It’s a more friendly culture,” agreed Toby Dunne, 12, who lives in Kennebunk and plays for the Bulldogs. In football, which he also plays, the helmets create a “faceless” opponent — an enemy you don’t feel any affinity for, he said. In London, Murphy was the captain of his team the last three years he played. The friendships he made were lifelong: one of his players asked him to serve as best man in his wedding, and he’s godfather to another teammate’s firstborn child. Like Murphy’s son, Toby Dunne has been interested in the sport from a young age. “I have a baby photo of me holding a mini rugby ball,” said Toby. His father, Tim, is an Irishman who grew up playing the game that he still referees. Although traditionally British and named after the Warwickshire school where it was developed in the mid-1800s, rugby arrived in the United States as early as that century but has always been overshadowed by the related sport of football. Micheli pointed to the increasing prominence of the sport as an appealing factor. For the first time since 1924, rugby is returning to the Olympics in 2016, and it’s showing up more often on cable television. “Kids think it’s cool,” he said. 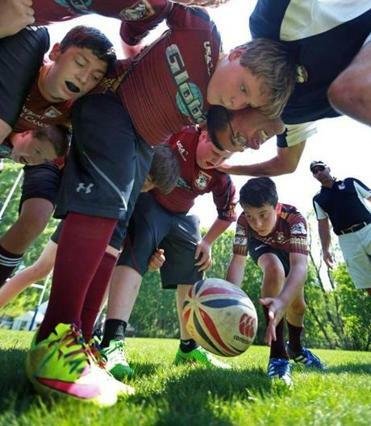 Rugby is also on the rise as a youth sport because “it’s a great sport for the hybrid athlete,” said Dave Hill, a player for the Boston Irish Wolfhounds who founded the Bulldogs program a few years ago. The Bulldogs currently field a high school-age team (under 19), a U15 squad, and a U12. There’s also a girls’ U19 team. With the emphasis on strength, center of gravity, and the smart use of open space on the field, it’s an ideal second sport for wrestlers and soccer players, said Hill. It’s also “great for the football guy who never gets off the line,” he said. In early May, the Massachusetts Interscholastic Athletic Association voted to make rugby an officially sanctioned sport beginning in 2016. The independently operated Bulldogs play a schedule that includes games against private schools and clubs from as far away as Manhattan and Greenwich, Conn. Last year the U19s traveled to London. For fans of American football, the rules (“laws”) of rugby are reasonably accessible. The field is bigger; there are 15 players to a side. Players are not permitted to make a forward pass, but they can choose to kick the ball. Unlike football’s incessant timeouts and commercial breaks, there’s a continuous flow to rugby. After a tackle or a stoppage, teams assume various formations — a “ruck,” a “maul,” a “scrum,” or a “lineout” — to resume play. Touching the ball to the ground in the end zone results in a successful “try” worth five points. For the Bulldogs, practice begins with a considerable amount of conditioning. After jogging around the adjacent soccer fields, the players return and split into age groups. While the younger boys worked on their spin passing, the older players lined up for a tackling drill. With five boys holding up blocking dummies, players took turns lying flat on their bellies. On cue, they scrambled to their feet, charging forward low to the ground. Grunting, they hit the pads with their shoulders, then dropped and rolled toward the next station. After hitting five pads, winded, grass-stained players chewed on their mouthguards, their chests heaving. The Bulldogs have played home-and-away games against more diverse teams from in and around New York. That’s another benefit of the experience, the coaches say. On a recent Sunday, the club traveled to Hingham to play at Derby Academy. Though the U15s won in a rout, 57-0, their hosts were gracious after the game. “The coach always says it’s the gentlemanly thing to do,” said Connor Gannon, a seventh-grader from Amesbury. He signed up to play with the Bulldogs to “get some more hitting in” during the football off-season. Introduced to the game by a friend whose mother is from Ireland, at first he thought it sounded “weird.” Now he loves it.